The sentinel nodes are the first lymph nodes to which cancer cells are most likely to spread from a primary tumour. Breast cancer usually spreads first to the lymph nodes in the axilla (armpit). These sentinel lymph nodes are the first to drain the lymphatic fluid from the breast and to spread cancer if it is contained within the fluid. What is Sentinel Lymph Node Biopsy (SLNB)? A sentinel lymph node biopsy (SLNB) is a procedure in which the sentinel lymph nodes are identified, removed, and sent for pathological examination to detect the presence of cancer cells. It is thought that if breast cancer cells were to escape into the lymphatic system, they would travel to the sentinel nodes before moving on to other nodes. 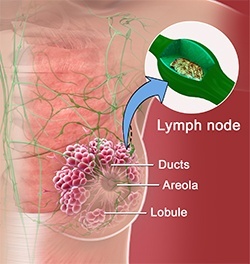 Sentinel lymph node (SLN) technique is based upon the study that tumour cells migrating from a primary tumour invade one or a few lymph nodes before involving other lymph nodes. 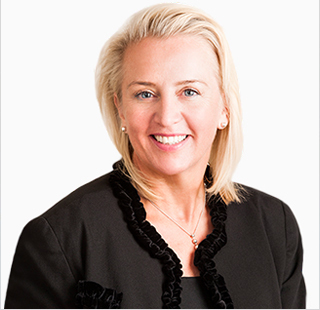 SLNB is a minimally invasive technique and is proven to be a reliable and accurate alternative treatment modality for breast cancer patients. During a sentinel lymph node biopsy, the surgeon removes only a few (1-5) sentinel lymph nodes. Dissection of the sentinel nodes reduces the possibility of complications and in most cases, provides the necessary information about the cancer. If the sentinel nodes are free of cancer, it is assumed that the remaining nodes are also clear and no further lymph nodes are then removed. The lymphatic system is a structure of lymph vessels and lymph glands throughout the body which play an important role in the body's mechanism of fighting infections and tumours. Tiny channels carry fluid and debris to the lymph nodes/glands which act as filters. Groups of lymph nodes are in the neck, underarms, chest, abdomen, and groin. The lymph nodes that filter waste fluid and cells from the breast are mainly located in the armpit (also called the axilla.) These lymph nodes are usually the first ones affected if cancer spreads beyond the breast. The number of lymph nodes in the axilla varies from person to person but usually ranges from around 20 to 40. Why is it important to know whether tumour cells are present in the glands under the arm? The status of the axillary lymph nodes is one of the most important predictive factors in women with early stage breast cancer. The axilla must be explored surgically and some lymph nodes removed and sent for pathological examination. Pathological examination of lymph nodes is the most accurate method for assessing spread of disease to these nodes. The treatment plan of breast cancer is based on whether the lymph glands contain tumour cells. Surgery (lumpectomy or mastectomy) in conjunction with axillary dissection/clearance is the best treatment option to remove the breast tumour. A significant number of lymph nodes are removed during the surgery. Lymphedema (localized fluid retention and tissue swelling) is a possible complication associated with the procedure. How is the sentinel lymph node identified? Sentinel Node Imaging is a sophisticated lymphatic mapping that will be performed the day before or the day of surgery. A small amount of radioactive substance is injected into the breast that flows to the sentinel nodes through the lymphatic ducts and can be seen on a nuclear medicine scan (lymphoscintigram). Lymphoscintigraphy is used to find the sentinel lymph nodes which are then removed and checked for tumour cells. Blue Dye Injection: Under general anaesthesia, a blue dye is injected into the breast. The dye flows through the lymphatic ducts to the lymph nodes. The first lymph nodes to receive the dye are removed and viewed under microscope to detect for cancer cells. It may not be necessary to remove more lymph nodes if the cancer cells are not found. Gamma probe detection: An intra-operative gamma probe (a highly directional Geiger counter) used in the operating room directs the surgeon to the radioactive isotope injected several hours before the surgery. The radioactive sentinel nodes are removed by the surgeon and investigated for cancer cells. Not necessarily all the lymph nodes that are mapped contain cancer cells. Rather, they are the first lymph nodes likely to be affected if cancer cells have escaped into the lymphatic system. Does Sentinel Node Biopsy indicate whether I should undergo a Lumpectomy or a Mastectomy? Sentinel node biopsy will not affect whether your tumour is suitable for lumpectomy (wide local excision) or mastectomy. When is sentinel node biopsy performed? Sentinel node biopsy is usually performed along with breast surgeries. Rarely, it is done as a separate procedure before mastectomy when immediate reconstruction is preferred. A final pathological report of the sentinel nodes allows for a complete axillary clearance at the time of breast surgery/reconstruction. Based on the status of the sentinel nodes, one can decide about the post-surgery radiation which in turn influences reconstruction decision. In some patients, the cancer cells are not seen in the sentinel lymph nodes although they are present and may have already spread to other regional lymph nodes or other parts of the body. A false-negative biopsy result gives the patient and the doctor a false sense of security about the extent of cancer in the patient’s body. False-negative SNB results may harm the treatment outcome for various reasons: missed nodes might lead to axillary recurrence that can be difficult to treat, diseased axillary nodes may be a possible source of distant metastases, and under staging affects decisions about systemic and specific radiation therapy to the breast, chest wall and nodal basins. Sometimes, cancer cells may block the lymphatic vessels running to the lymph nodes that contain cancer cells and result in a false-negative report. In this case, the radioactive substance flows and stains the normal lymph nodes. A false-negative result can be avoided by removing the abnormal palpable nodes (not stained) during the surgery. Multiple sentinel nodes are present in most breast cancer patients, and it is now accepted that cancer cells often drain directly to a group of nodes rather than to a single node. Removal of sentinel lymph nodes is based on cherry-picking phenomenon leaving the axillary lymphatics in areas away from the sentinel nodes.